Home » THANKSGIVING » Why Give Thanks? When you sit back and think about your day, week, month, or even year, what do you see? Do you dwell on everything that has gone wrong (or hasn’t gone the way you would like) and how things could have been better? Or do you see how far you have come and give thanks that despite everything you have gone through you have not been consumed? Psalm 136 tells us to “Give thanks to him who alone does mighty miracles. His faithful love endures forever. Give thanks to him who made the heavens so skilfully. His faithful love endures forever. Give thanks to him who placed the earth among the waters. His faithful love endures forever. Give thanks to him who made the heavenly lights. His faithful love endures forever. The sun to rule the day, His faithful love endures forever. His faithful love endures forever” (vs4-9 NLT). Embracing a lifestyle of constant gratitude to God unlocks the fullness of His presence, as well as His blessings into our lives. Such a life is infused with hope, peace and security, knowing that God is always there and will always come through. I have found that the more grateful I am, the more of God’s blessings I tend to experience all around. When I consciously embrace a lifestyle of being thankful, I find that it reminds me of the constant presence of God, thereby banishing all fear. Just like an earthly father, I believe God’s heart swells with pride when we simply say “Thanks Dad” – for the big and small, or seemingly insignificant things He does for us. Thanksgiving is a free resource and it is an extension of the online blog of ‘A Day in God’s Will’. 31 Days of Thanksgiving and Praise is a time when we look back on the year so far, pause and remind ourselves to simply say “Thank you God for everything.” My prayer is that as you read this book, God will gift you with a heart and lifestyle of gratitude; one that will open a new dimension to experience all His goodness. Why not start cultivating the habit of Thankfulness and praise NOW! 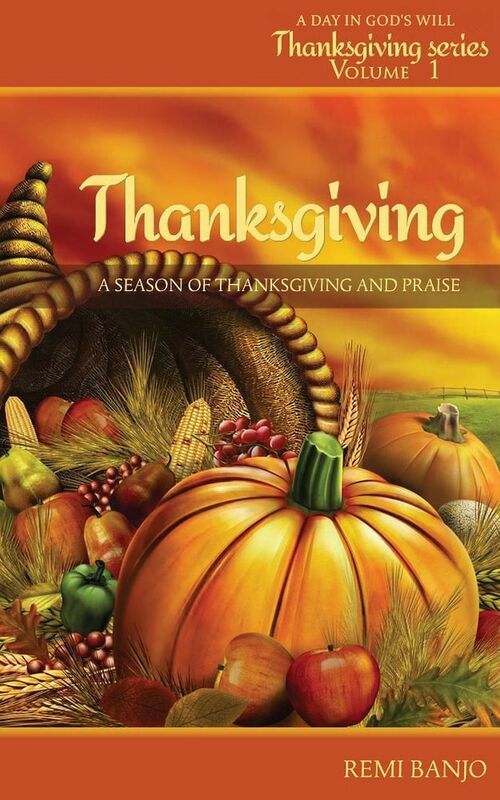 Download your free copy of Thanksgiving by clicking on the book picture below.